Readers, I can’t thank you all enough for the emails, the messages, and the love! Seriously, you light up my life. I am happy to tell you that Sworn To Quell: Courtlight #10 is DONE DONE DONE. It is one of the longest books I’ve written in this series at 85,000 words and I seriously hope you enjoy it as much as I enjoyed writing it. Without further ado, here is your latest release in the Algardis Universe! Ciardis Weathervane witnessed the collapse of her empire’s system of governance. Because everything pivoted on the rule of one man. Now she must forge a new path. Through the madness. Through the chaos. Still with the imperial palace in ruins, and the coalition between the nobles and the rebellion falling apart, there is no more time. No time to rule. No time to justify. The god was here for retribution, and her triad would be forced to rise to the occasion or fall under its own bluster. 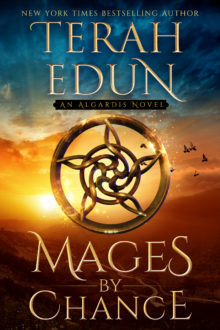 With an emperor dead, a prince heir uncrowned, and a people lost in the wilderness of death and destruction every which way they turn, Ciardis faces her most challenging assignment yet. Picking up the pieces. Mending the coalition. Winning the hearts and minds of Sebastian’s people. The people she could now call her own. The heavens have come to earth. It remains to be seen if the earth will fall before its might. Next, last but not least – below the two latest compilations/boxed sets that I have to offer you! The short stories compendium is for the readers who prefer to have a single compact set to peruse at their leisure of my pre-released (and free on the newsletter: teedun.com/news) short stories set in the lands you are familiar with from the Courtlight and Crown Service series. It includes the first three short stories written in the Algardis Universe: The Rose Hedgewitch, Across The Arid Seas, and Lillian In Heels. 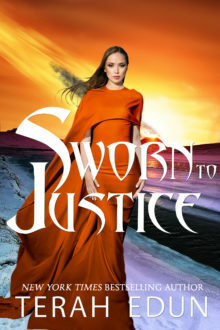 Next, the Courtlight Series Boxed Set is a compilation of the last three books in the Courtlight Series: Sworn To Vengeance, Book 7, Sworn To Sovereignty, Book 8, and Sworn To War, Book 9. You can grab both the boxed set and the compendium on all retail stores including Amazon, Barnes & Noble, Kobo, iBooks, and Google Play. Last but not least, my next release is BLADES OF ILLUSION: CROWN SERVICE #2. I’ll be announcing the new cover details and a brand new trailer soon, so please subscribe to the BLOG to get your updates immediately. 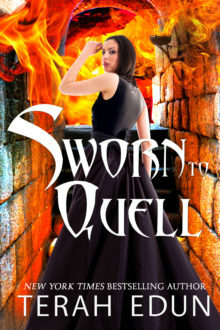 For those wondering, Sworn To Quell is the 10th book in a 12 book series. There are two more and then the Courtlight series is complete!